Competency by Design (CBD) is the model of the competency based method of medical education that is being used by the Royal College of Physicians and Surgeons and is currently being launched in the Department of Psychiatry. It is a system of medical education that focuses on outcomes and is based on a framework of competencies. It is a change to postgraduate residency training with the goal of enhancing patient care by improving resident learning and assessment. CBD rolls out to all PGY1 residents in the 2018/2019 academic year. 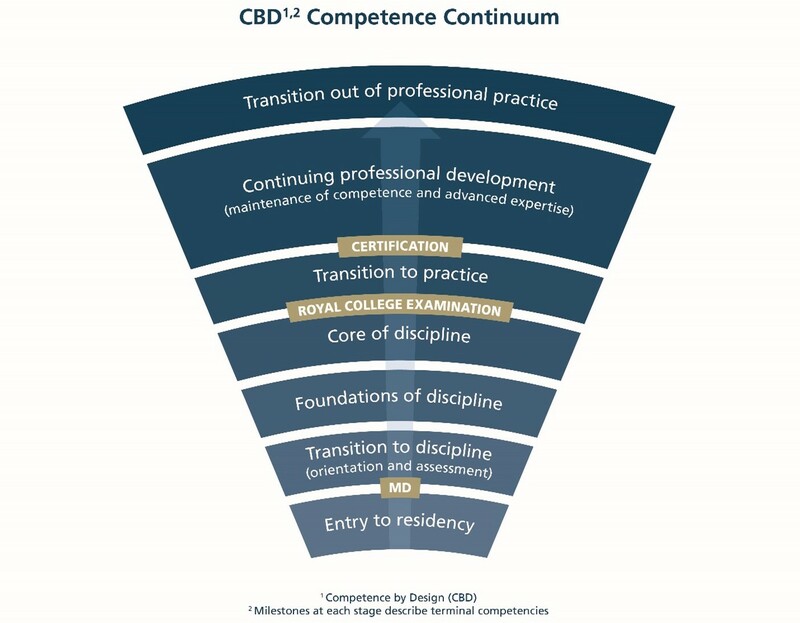 CBD organizes training into stages, provides guidance for teaching and learning at each stage and includes frequent, in the moment, low stakes assessments of competencies. The competency stages are assessed using a series of entrustable professional activities (EPAs) which are made up of measureable milestones. Residents must demonstrate EPA competence in order to progress through their stages of training. For additional information see the CBD Handbook! For detailed information on the EPAs at the Transition to Discipline and Foundations of Discipline competency stages, visit the EPA description and cheat sheets here.